As I was mulling over what to do for the MQG Riley Blake Fabric Challenge, I went looking for My Quilty Bucket List, fishing for ideas. Compiled early last year, the list has been a consideration several times when I've been wanting to start on a new project. Right there at the top as #1 was an Irish Chain quilt, a design I've wanted to make ever since my early quilting days. Except when it came time for this challenge, I didn't want to make it all that traditional. The result is Mod Irish. A big part of this challenge was using a fat-eighth bundle provided by the MQG. This year, it was Riley Blake's The Cottage Garden by Amanda Herring of The Quilted Fish. The rules allowed the use of additional fabrics from the collection, and I chose to add in the black/white text and the teal/gray/white triangle prints. This may have been the first time I used a text print for an entire quilt background. At any rate, I liked it immediately, and it kind of makes the quilt for me. I pieced the backing with more of the challenge fabrics, and then started thinking about how I should possibly quilt it up. I always go to my fmq + wf etc. Pinterest board (shorthand for free-motion quilting, walking foot, etc.) 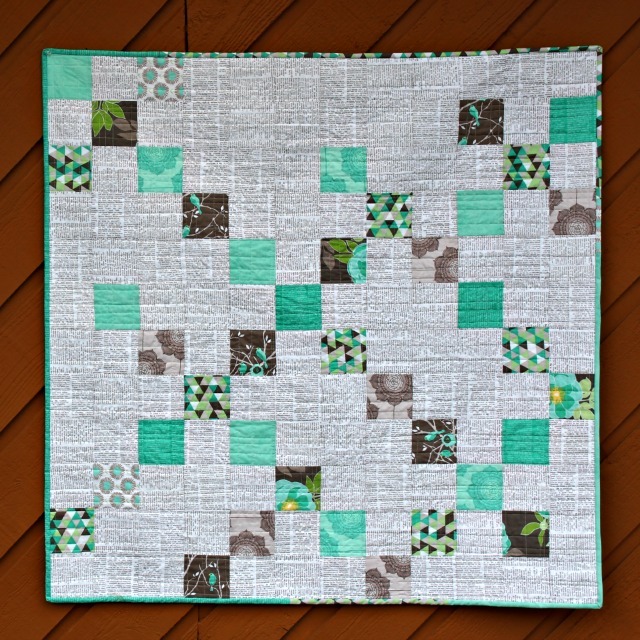 when looking for quilting inspiration, and this quilt by Robin/simply robin caught my eye. I knew I'd seen something similar recently, and quickly found it over at Alex's teaginny Designs. Since I'd never tried anything quite like it, and it seemed to coordinate with the square elements of the quilt, I went for it. 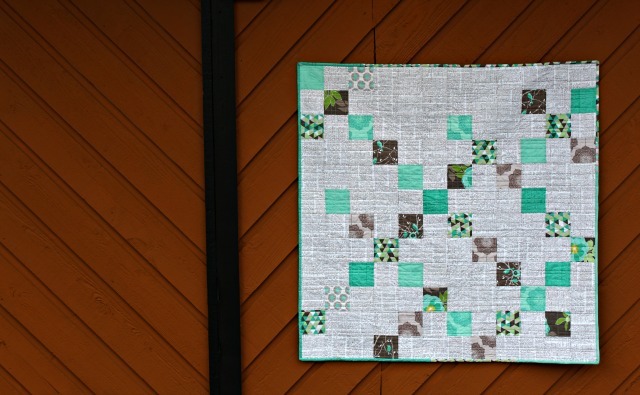 As I progressed with the quilting, I was pretty sure the grid was getting lost on the quilt front, especially in that newspaper print. But as you can see in the photo above, it was doing amazing things on the back! 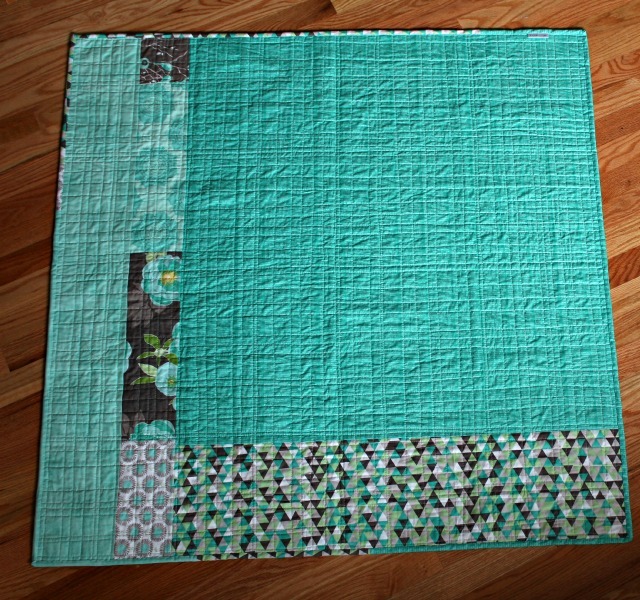 For the binding, I used the few bits and pieces I had left to create a scrappy look that I think serves the quilt well. Mod Irish finished at 44" square, and even though it's not the traditional Irish Chain I had always planned on making, I'm checking it off my quilty bucket list. If you'd like to see more of the challenge quilts, checkout the Instagram hashtag #mqgfabricchallenge. This quilt was donated to 100 Quilts for Kids 2015. Fabulous quilt and quilting! You were definitely up for the challenge! 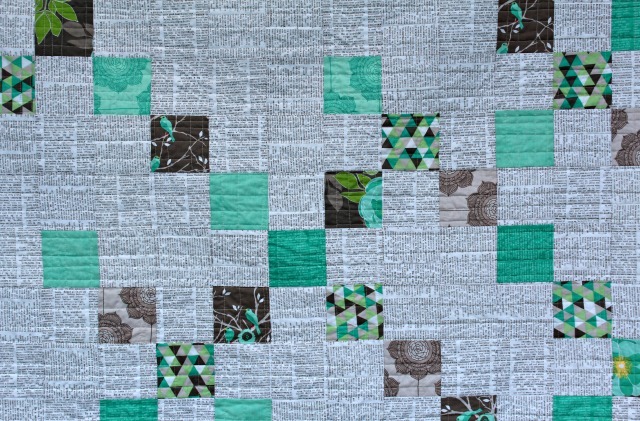 This is lovely, and I love the quilting! I really love how you placed the fabrics to have clear echoes of the Irish chain but then again it is not an Irish chain - I love the design. I like the modern twist to the Irish chain. Off centered. I've often wondered about using the same text print instead of the scrappy approach to a background. It's also nice to see how it works. I like the look.